Bug, Boo, and Bean: Munchie Night and a Delicious Gift! Munchie Night and a Delicious Gift! The other night we changed things up a bit for dinner. We cuddled together in front of the TV and had munchies instead of a formal meal. I was very excited to try out an idea i learned from Hungry Girl. Wonton Tacos! These tiny tacos are fun, delicious, and perfect for little ones (though my 5 year-old ate three of them...). To make these, you'll need a package of won ton wrappers. They are refrigerated, usually near the tofu in your local grocery store. You'll also need whatever it is you like in a regular taco - ground beef cooked with taco seasoning, salsa, sour cream (we like ranch dressing! ), lettuce, tomatoes, olives, peppers, onions, whatever! To make your shells, spray the edges, inside and out, of a 9x13 cake pan with cooking spray. Drape your won ton wrappers over the edges on a diagonal (don't overlap them). Bake them at 350 for 3-5 minutes, or until slightly brown. voila! (the ones on the left are a little underdone... but they worked okay). While they cool, chop up your ingredients - even the lettuce. Throw all your ingredients in a bowl and stir together. Something liquid like salsa, sour cream, or ranch dressing REALLY helps hold things together so they don't fall out as easily when you eat. Even so, you can just top them with filling and eat it like a chip! Enjoy your tasty, snackalicious dinner! My boys were crazy about them! And for dessert, we made these. Delicious, and oh so addicting!! Man, i love S'mores! 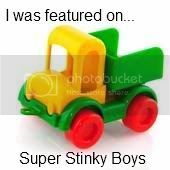 They were just too adorable, and i instantly thought of the wonderful ladies who run my boys' play group. 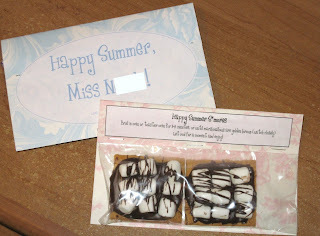 The group runs through the summer, so there was no end of school celebration, and i kinda missed teacher appreciation week, but i wanted to give them a couple of these as a small token of our appreciation. You can give teachers gifts anytime, right? So i put two S'mores in a snack size ziploc bag. 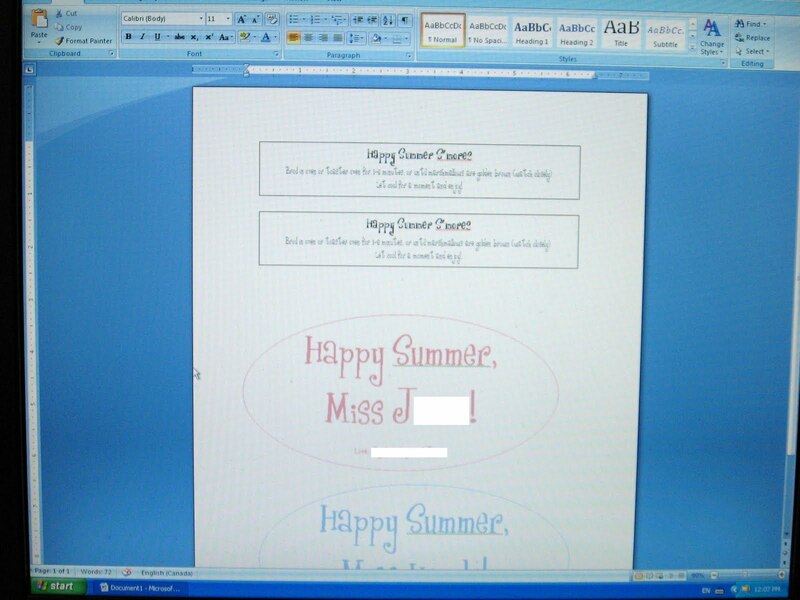 Then i got out some pretty paper and cut a bit off the long side so they measured 6 1/2 in x 11 in. then folded the top (the creased edge) down about 1 1/2 in and stapled it over the zipper part of the bag. 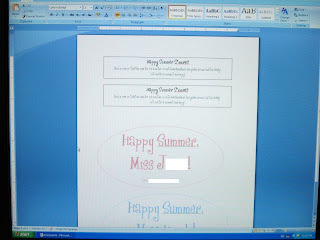 then i printed off a couple of labels, saying "Happy Summer!" for one side and instructions for cooking the S'mores for the other. For the curious - the rectangle was 1 in. x 6 in. and the oval was 3 in. x 6 in. Cut them out, glue them on and we're done!! 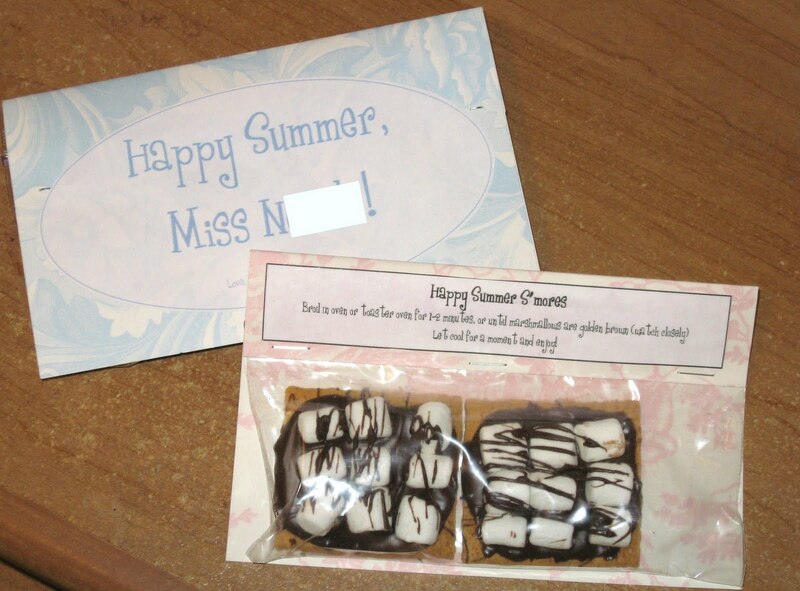 Sweet treats for our sweet teachers! Oh yum! And your s'mores look amazing! Cute packaging too!